During the month of April, garden activities begin in earnest in the Northeast. If you are thinking about starting a garden you'll want to have that project well underway by now. 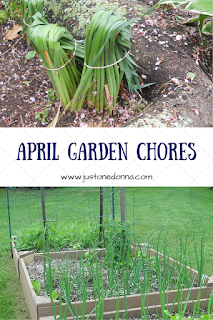 My post, Five Steps to Starting a Garden will help you get started. Check that your garden tools are in working order: Check the handles on your spades, hoes, and rakes. Can you find your pruners? Checked your hoses and nozzles to ensure there are no leaks and the water flows freely through the nozzle. The spray nozzle on my hose gives me a shower every time I use it. I really need to replace the nozzle that worked fine last year. Clean up debris from your garden beds: You probably have some accumulation of debris from the winter. Remove all fallen leaves, sticks and any remains from last year’s garden. Now is a good time to re-edge your garden beds and for a nice, tidy look. Prune and plant trees and shrubs: Check for winter damage on your trees and shrubs and prune as necessary. We had a relatively mild winter this year and have been doing this periodically the past couple of months. Prune shrubs that flower in the summer, shaping them and removing any dead wood. Prune your spring flowering shrubs after the blooms go by. Fertilize your spring-blooming bulbs: You'll want to fertilize your tulips, daffodils, and hyacinths after they finish blooming. The daffodils are in bloom in my garden right now. Cut away the green foliage only after it dries and turns yellow. This allows the bulb to store energy to ensure good bulb growth the following year. To help keep the garden tidy while I wait for the right time to cut back the daffodils I use elastic bands to tie the leaves of the withering foliage together. The bands deteriorate pretty quickly in the garden and are easy to apply to the plants. Stop Weeds. Spread a pre-emergent herbicide to prevent weed seeds from germinating in your garden beds. I do this every year in my perennial flower beds and it helps me keep those pesky weeds in check. Plant cool-season vegetables. Amend your vegetable garden soil about a week before planting. Your cool-season vegetable crops such as peas, broccoli, carrots, spinach, and lettuce can go in the ground now. These are easy to grow from seeds or transplants and you still have a little time to get them going. You'll be so happy when you can make a salad from all the delicious vegetables and greens you have grown. Add color with cool-season annual flowers. Pansies, snapdragons and pot marigolds planted in containers near your front door, along walkways or around mailboxes will brighten your days. I especially like the brightly colored yellow and purple pansies and their blooms will last through the early summer. April is a great month for getting out into the fresh air in your garden. What activities have you planned for your garden this April? I'd love to know what you are planting this year. I can't wait to get out and garden soon. I love this checklist! The weather was so icky with cold nights and I was afraid to plant anything. Thanks so much for sharing this! You are so right! The weather in the Northeast has been icky. Be careful about planting annual flowers too soon. Be sure the vegetables you plant now will thrive in cool temperatures. It's still too soon to plant most things. This looks like it will be very helpful for those in your area. Your garden plots look very healthy and ready to go. Thanks for checking in, Kathleen. Yes, the garden is ready to go. It's now or never.